student must find for oneself. At Sunshine World you can benefit from having the most highly experienced, qualified and dedicated Ski Teaching Professionals there to help you towards YOUR goals. Skiing is a FREE sport- there are no rules. We will help you to find the style and technique which is right for you. The Sunshine World Pro Team is committed to helping each individual explore this wonderful sport in a free environment where there is always room for self expression. We believe that there is no absolute truth that must be adhered to in order to ski “well”. We believe that as long as you are safe and are having the time of your life then you have got the right idea- whether you are cruising merrily down a green in a secure snowplough or sliding backwards down a black on one ski (yes it can be done!). Whatever your standard from total beginner to instructor level at Sunshine World we have a proven track record (read our testimonials if you don’t believe us 🙂 of helping our guests to surprise themselves time after time with how much they can achieve and how much they can ENJOY sliding down a hill. This is a magic and very exciting position to be in. 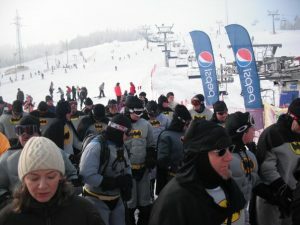 You have never skied before. You have the understandable fear of the unknown and the anticipation of what’s to come- you aren’t even sure if you’ll like it! At Sunshine World we love first timers because it reminds us of how wonderful it is to discover this magnificent sport all over again. Our Pro Team will help you through the Beginner Progression safely and at whatever pace you feel comfortable with. Some people will be cruising happily down the greens and using the chair lift unassisted within just a couple of hours. Some prefer to take more time and we are happy to use the softly, softly method of building the necessary coordination and awareness in a step by step progression that keeps YOU in total control with no fear of being “thrown in at the deep end”. How else could we safely teach four year olds to ski? At this stage we will introduce you to the concepts of Posture and Balance, Rotation of the skis and Edging: Which will help you to stay on your feet, change direction and STOP (always popular!). 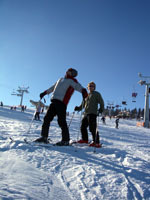 You’ve been skiing before on dry ski slopes or on holiday and have between 2-7 days experience. 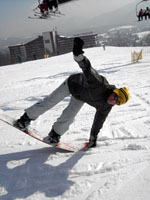 You have the ability to use button lifts and chair lifts and can make your way down a green slope fairly comfortably. At this stage you may be thinking of refining your technique and challenging new, slightly harder slopes. This is a stage in people’s skiing where it is very easy for an instructor to impose their opinion of “good” skiing onto someone. There are many ways to improve and achieve results and hundreds of possible exercises to build coordination and skills- none of which are the absolute way forward. At Sunshine World we believe that the best results are the ones which YOU want to aim for and so we talk to YOU and get a feel for which direction YOU would like to take in improving your skiing. Of course we can give you suggestions also but we will never stick to a “one method fits all” approach which so many ski schools and systems have to as they churn out such large numbers of people (and convince everyone that regardless of how good they may be they MUST still buy skiing lessons again next year!). We prefer the personal approach. As our business does not rely solely on teaching skiing we have the luxury of actually being able to be completely honest about how much coaching a person still needs without adding our sales targets into the equation like other ski schools often do (but wont admit to!). Possibilities at this stage can be to introduce you to carving (maybe even racing through some gates! 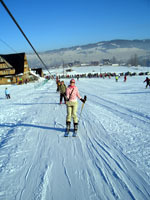 ), small moguls (bumps), steeper slopes- Blue or even Red runs, basic freestyle techniques such as Riding Switch (backwards), taking some air (jumping) and trying out some variable snow conditions and maybe even a cheeky bit of easy off-piste. Pressure Control- Using vertical body movements to increase or decrease the amount of pressure on your ski/s (like an intelligent suspension which you control). Timing, Rhythm and Coordination of your movements- to help you flow down the hill smoothly. You have skied on snow for at least 10 full days and have already experimented with harder pistes- blues, reds, maybe black and maybe with moguls, easy off-piste and maybe carving. Maybe you have played around with some basic freestyle manoeuvres also. 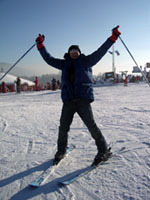 You have begun to establish a technique and style which you can feel is “yours” and consider yourself to be a competent skier. Piste: We can help you develop more control on piste and build towards strong ability in carving, short radius turns, Gibbing (piste-based freestyle tricks) and generally helping you to flow down slopes “effortlessly”. Freestyle: Ah yes, the New School is upon us. Only it isn’t really new. Skiing has always been a free sport and there have never been any actual rules like in tennis or football. The idea of Freestyle is simply to help us focus on the fact that when we’re on the hill we don’t HAVE to listen to anyone else’s way of doing things, we don’t HAVE to stick to any rules (apart from the safety regulations of course! ), we can simply do whatever puts a big smile on our face- we aren’t hurting anyone after all! If you want to learn how to ski down the hill in ever more imaginative and challenging ways we can teach you a whole variety of tricks. From manuals to grabs to rotations to rail slides to wall rides we can help you to understand the lingo and actually perform some funky moves of your own- we might even catch you on film or in a photo! Ok, you’ve arrived. You are already a very strong skier or boarder and you probably feel that you don’t need any more coaching. We agree! Once you have the ability to take on even the hardest marked slopes and feel comfortable with bumps, steeps, variables and freestyle and have chosen which areas you prefer and have a style which you feel confident and comfortable with then of course you don’t NEED coaching. You can just have fun! That’s why we do this after all isn’t it? So where does the Pro Team fit in if you don’t NEED us? Well, just because you’re comfortable doesn’t mean you’ve done it all. Some of our Pro Team have been skiing and riding since 1987 and done thousands of hours of coaching at all levels and yet we all keep thinking of new ways to challenge ourselves and each other in the name of having fun. If you’re interested you can also shadow some of the Pro Team’s coaching sessions and we can help build your ability as an Instructor. We can even train you until you’re at a high enough standard to take your own Instructor’s qualifications!